Along the ancient Pilgrim Trail traveled by countless crusaders from Europe to The Holy Land, Dr. Rory Osgrove is in charge of her first archaeological dig. A Biblical Archaeologist by degree, her target is a holy relic of unimaginable power. But what she discovers instead is the tomb of a long-buried Crusader, one of the thousands who came to this desert land in search of glory and riches. Deterred from her original goal, Rory is fascinated by the English knight and the journal buried with him. Reading the pages of the ancient diary, she comes to know a man of power and honor, entrusted by Richard the Lionheart with a mission of astonishing importance. Sir Kieran Hage was no ordinary Crusader and, as Rory discovers, nor is he really dead. Eight hundred years later, Kieran's mission must be completed, but there is an ancient evil that follows him and is still determined to see him fail. Now Rory begins the adventure of a lifetime, where time has no meaning, where honor is strength, and where only true love endures. 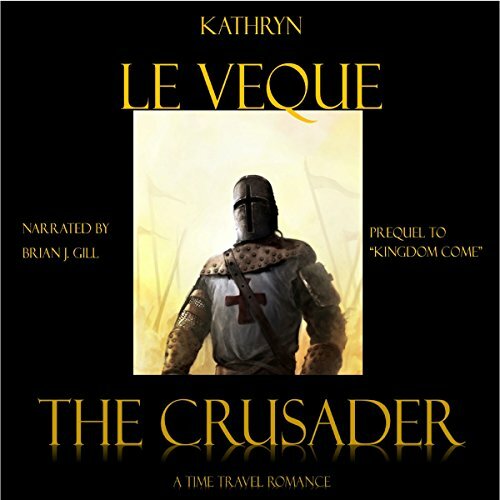 I always enjoy Kathryn Le Veque's books and this 2 part "the crusader" series is no exception. This first book takes place in the year of 2012 and introduces the main character Rory, who is an archaeologist on a dig for religious artifacts. She is a strong willed character who fights for love even when centuries threaten to divide. Nice concept but it seems like the writer didn’t know where to take it. Detailed character development, historical research at first dissolved into wandering plot and cliches. Awesome opportunity to explore all kinds of great themes but wasted when she tried to turn it into an action script complete with marines and armor plated convoys. Then they disappear in a puff of smoke...? Good grief, did your editor call you and tell you to hurry up and get on to the next? but just... problematic, in a lot of places. IDK. I enjoyed parts of it, but found parts almost unbearable. Would you listen to The Crusader again? Why? Yes! It's an awesome roller-coaster adventure. The plot & character development are exciting, and of course the romance is electric. Its fun to day dream & imagine what it would be like to meet a real living, breathing knight in shining armor. I like the reverse Sleeping Beauty premise in modern times. What other book might you compare The Crusader to and why? It kind of reminds me a little to Johanna Lindsey's "Knight in Shining Armor" as that's also a romance story about a contemporary heroine who meets an English knight. That's one of my all-time favorite romance novels, and so is this book & it's sequel "Kingdom Come." This is one of Kathryn Le Veque's best!!! I liked how he effortlessly changed between contemporary American dialects to the historical English knight's accent. He also did a great job towards the end of the book with the additional characters' & slightly changing his timbre/tone for their voices. Not a specific moment, but I love the whole book! It's one of Kathryn Le Veque's best in my opinion & one of my favorites by her!!! It's a must read/listen and so is the sequel "Kingdom Come!" Previously read this book from KLV's special boxset. Best enjoyed if read/listened as a duology w/ 'Kingdom Come'. I was very impressed with Brian J. Gill's narration where he easily, smoothly switched between British and American accents vs medieval knight's accent. Exciting, Suspenseful, Riveting & Passionate. Have you listened to any of Brian J. Gill’s other performances before? How does this one compare? Brian J. Gill did an excellent job narrating this story. Author Kathryn Le Veque has the most amazing talent of weaving in and out of history, adding creative and passionate characters and with a spellbinding effect, delivery a one of a kind story that leaves you breathless. The Crusader is so much more than a romantic time travel. It is an exciting quest of a team of Archaeologist to locate a holy relic. A modern day woman, Dr. Rory Osgrove and an ancient Crusader. Sir Kieran Hage discover love and passion so true, it defies logic and time. This is a fast paced, thrilling and completely captivating adventure that pulls you into a world of discovery, intrigue and romance. I was captivated from the beginning, wrapped up in suspense and carried away into this creative, riveting story. Another epic adventure by the extremely talented Author, Kathryn Le Veque. A must read that will keep you on the edge of your seat and capture your heart. I have no idea why this book received so many high reviews. All the main characters are annoying. The author has a really hard time getting to any point. Also, the constant bickering just to cause angst is greatly unappealing. I could not finish the book. I like the premise. A biblical archeologist is on the hunt for the crown of thorns worn by Jesus. A crusader entrusted with the crown hides it before he is killed by a betrayer and an alchemist who is able to suspend life and heal our hero. 800 years later these two find each other to complete the ancient holy task. But our hero and heroine die and a puff of smoke from freak lightning? Come on, we need more than this. It seems the writer got lazy at the end. Very disappointing. And all throughout the book, I kept wishing the author would answer my question, "What happened to the alchemist and the innkeeper?" I love time travel romance, but this is the most unique I've ever read (listened to). Full of action and history.